It might be the dead of winter here in Vermont, but that isn't stopping me from dreaming about Spring Break! That glorious week off in March was such a highlight of my college years, as I'm sure it was/is for many of you, too! Unfortunately, there isn't "spring break" in the adult world. 😥I don't have any fun travel plans on the agenda right now, as I'm having saving my PTO for the winter/spring months for some other reasons. That's the joy of being a grown-up! 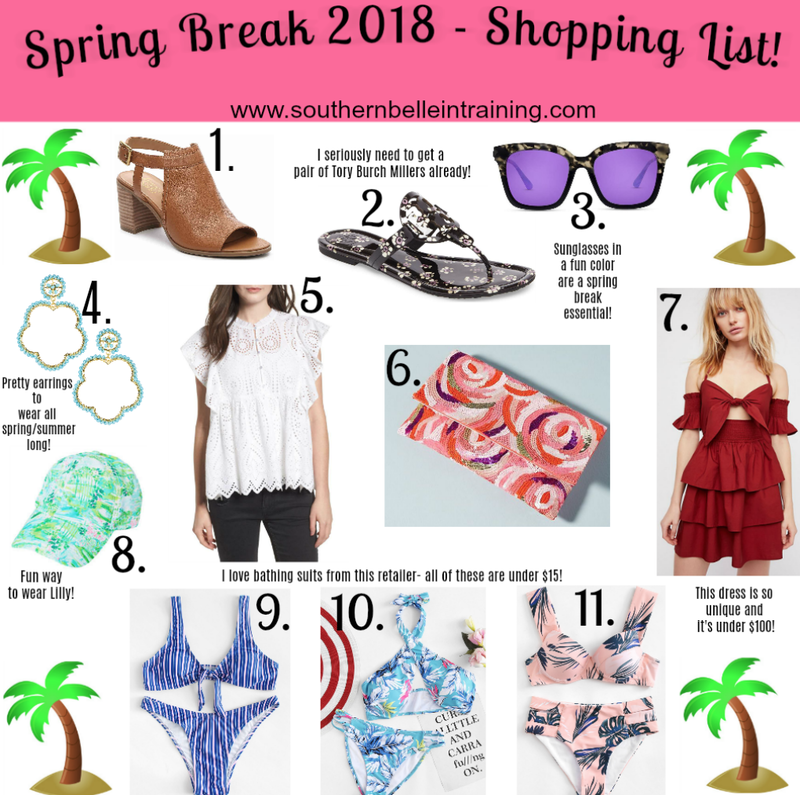 I hope sometime in the next couple years I can head somewhere warm and sunny at the end of winter again, but until then, I wanted to share some of my favorite online shopping finds that I would totally be ordering if I had a tropical trip on my agenda! 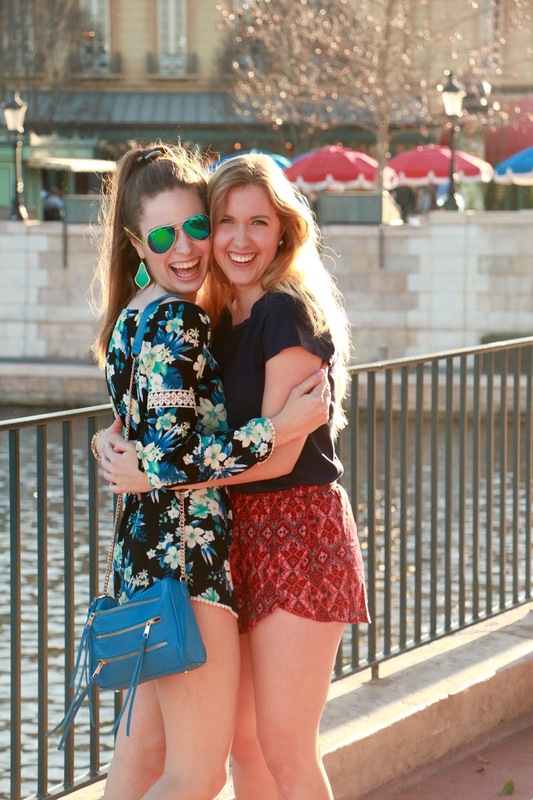 I also thought it would be fun to share a throwback to what I did for each spring break in college... since I blogged all through my college years I have posts about every trip I went on! Part of the reason that shopping for Spring Break is so fun is because you can go wild with colors and fun trends! I love putting together bright outfits, so this was always like a color explosion for me with fashion after a long winter season. If you prefer to keep things more neutral or pastel with your outfits, you can always add in some bold accessories, like this beautiful beaded clutch or these fun purple mirrored sunglasses. Swimwear is one of those things that prices can vary so much on. I have some bathing suits that I paid a bit more for that have lasted several seasons, which is great. But I have others that I buy cheaply and I might get a season or two out of them (sometimes more if they don't have a lot of chlorine exposure), and then when they're worn out, I can just purchase new ones, since they weren't expensive to begin with. Last summer, I tried out some bikinis from my favorite online affordable retailer, and I was amazed at the quality!! The ones I ordered I'll definitely be wearing in 2018, and I look forward to buying more as well. The ones I featured above are all under $15- how can you not order like 5 of them?! Now let's take a look back at some of my Spring Break memories! Sometimes I take for granted the fact that I've had my blog for almost five and a half years... it is so fun to be able to look back when I want to on parts of my college years like this!! 2013: My freshman year of college Spring Break was actually a low point for me in all of college. 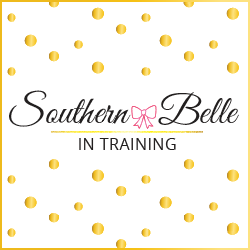 (My OG Southern Belle in Training reader friends will remember this!) I got sick with a weird mono-type virus during spring semester of freshman year, and ended up missing almost three weeks of school, and was put on involuntary academic probation. I could not get over the virus I had, and I ended up flying home to Maine literally just to sleep in my own bed for a week and have my mom take care of me. This was also at the time when I began applying to other schools in North Carolina to transfer (I originally went to a Christian college in rural North Carolina, and then transferred to Queens University in Charlotte the following fall! ), but doing college applications a second time was very stressful, in addition to being sick. Not a fun Spring Break! 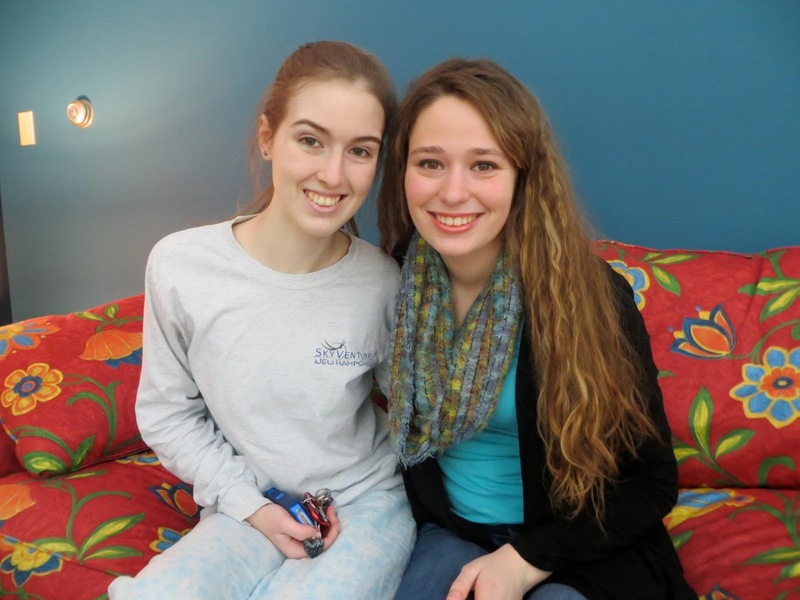 Spring Break 2013: My best friend from Maine, Jules, came to visit me on one of my last days home! 2014: This year was a big step up from the previous year!! I debated going on a Bahamas cruise that a bunch of my sorority sisters were doing, but I didn't think I had the personality or interests for a traditional college Spring Break experience. A week of nonstop partying and hookups didn't really sound like my cup of tea. My dad and I ended up doing a trip together and it was the BEST! We spent a few days at an all-inclusive resort in the Dominican Republic. This was one of my favorite blog posts from that year's trip, and a look at one of my early travel blog posts! 2015: My dad and I had so much fun in the DR the year before... we returned for another round! There's actually a more detailed story about why we went back again which you can read in this blog post. We stayed at a different hotel in 2015, but it was still an all-inclusive resort. This year's trip was more relaxing than our first time: we literally didn't leave the beach and our lounge chairs during the days we were there! 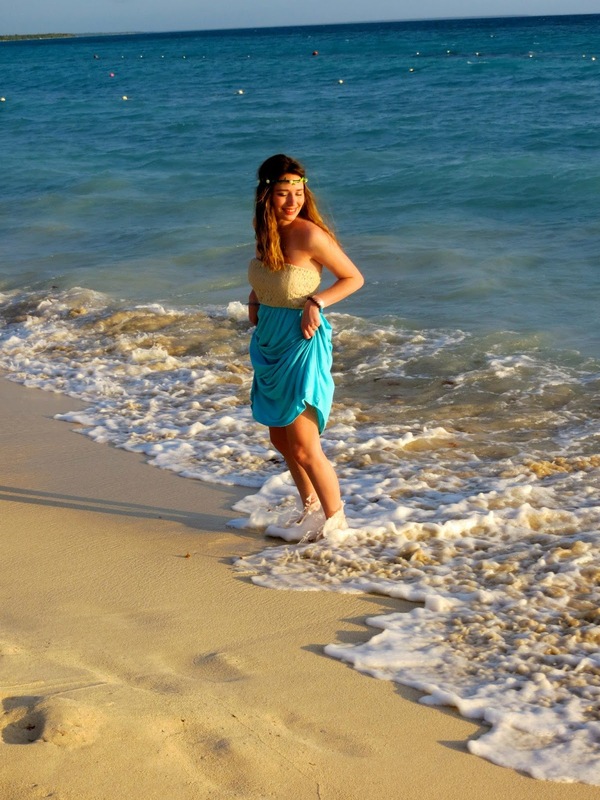 Spring Break 2015: Return to paradise in the Dominican Republic! 2016: It's hard to top a relaxing few days in the Caribbean... but I think my final Spring Break of college might have done just that. My dad and I decided to go on one final adventure together, but this time we invited my senior year suitemate, Caroline, to join us. We went to Orlando!! We did two days in Disney, and a day exploring Orlando and our resort in Universal. It was an absolute blast and one of my favorite memories from all of college. (Here's my Orlando Travel Guide from the trip!) The week finished by my mom flying down to Charlotte to help me and Ciera, my friend who would be my post-grad roommate, search for our first apartment in Charlotte. We were successful and the lease was signed that week! And there you go- all of my college Spring Break memories! Please don't remind me that in May it'll be two years since graduation... it's starting to hit me that I'm actually an adult now and getting older.... ha! That white lace top will look so cute on you! You should definitely get it! Love everything on your list and how neat that you shared your memories. So fun! This post is making me miss my college days so much!! Spring break was always so much fun! I love the sunglasses you linked! This makes me miss college too! Great times! Looks like spring break is going to be nice for you this year. I loved the floral dress is spring 2015. What great memories to share and great vacation accessories! I love the pink palm bikini! I'm so ready for warm weather!! Ahh I wish I still got a Spring Break - I've been out of school for far too long! I am loving the white top and the first bathing suit! No spring break in #AdultLife unless I take time off, but I'll be enjoying every single weekend! Love the light pink swim suit. Looking for new suits always gets me in the mood for travel and warmer weather!